I went to a housewarming party yesterday. My friends Mr. Zhao and his wife Ms. Lu have quite literally moved across the river to the prosperous east-side of Liuzhou. 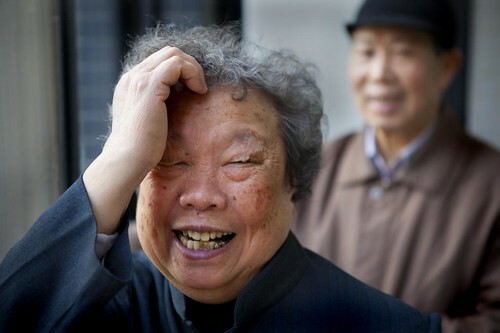 Zhao, 75, and Lu, 72, pretty much adopted me when I first moved to China. They were neighbors and befriended me (and my belly) nearly from day one. Seriously, they would have fed me everyday had I let them. I eventually moved to a different part of the city but we have remained close. They were understandably in good sprits and very proud to be showing me their new home. The move was made possible by their children. Two daughters, educated in Beijing and Shangahi, both with great jobs and well-married, bought the apartment and spared no expense on the interior design and decoration. More and more of China’s newly minted middle class are able to provide for their families like this. The grandparents take care of two grandchildren but will now certainly be a bit more comfortable while doing so. Here’s a shot I took off the couple a few years ago in which you get a glimpse of the old house. The new one is a tad nicer but I had to promise not to show any interior shots of the new house until everything was completed! Three generations join in the housewarming celebration, sharing memories, laughs and yams! Ms. Lu fights back tears as she tries to express her appreciation to the family for her new home. Ms. Lu worked for more than 30 years in the Liuzhou train factory and Mr. Zhao is a retired Physics teacher. They’ve been married 42 years. Mr. Zhou was perhaps most proud of his new SONY 52″ HDTV. He still hasn’t taken off the shrink-wrap, which somewhat negates the HD viewing experience. Here he is pouring tea for his guests. Jia and Lily listen to Ms. Lu describe all the amenities of their new home. Aside from the SONY, all the furniture is new. There is a washer AND dryer (her first), a huge Siemens fridge, a western toilet with AC and heat (also a first) in each room. I’ll go back and shoot the interior once I’m allowed. So, what else? We had a fantastic dinner with American friends last night, soft-shell tacos and then strawberry short-cake for dessert. We also got to see (and hold) the latest addition to their brood. There is nothing like the smell of an infant. Well, not THAT smell. You know what I mean. It’s crazy warm here today (yesterday too), like about 82 Degrees and humid. It feels like summer and not at all like spring festival is just around the corner. I’m wondering who is visiting the blog, as the traffic count has shot through the roof the last week or so. Looks like some folks in Frisco, Texas and Red Lion, Pennsylvania either really like or really hate the blog! Until tomorrow… Peace! ~ by Expatriate Games on February 9, 2010. This is a great picture of Jia and Lily! They look so much alike…which is mother which is daughter? How about this weather!!! It made me almost regain my sanity today….almost. I could definitely get use to it. I’m afraid it won’t stick around long. Great entry. I am looking forward to seeing the apartment when completed! So happy for your friends, the elders for their new digs and their children for being able to help them obtain it. And, of course, for the grandchildren who will be lucky enough to spend time with their grandparents instead of at day care. Full-circle… no better feeling in the world. Thanks Rosy. Yeah it was pretty emotional at times yesterday… everyone was so proud and there was this sense of accomplishment. 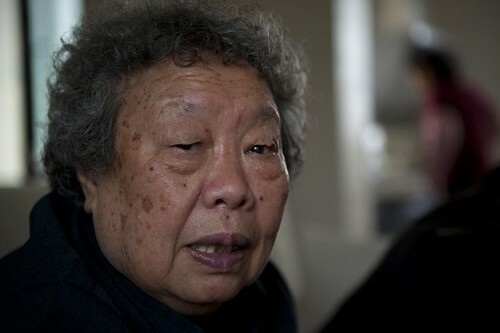 Ms. Lu said the house was more money than she had made her entire life. I don’t think that was even close to being an exaggeration either. It’s wonderful that there is a culture were they respect and remember there elders and take care of them. I have to admit Dana, that is one thing they do over here a little better than we do. A beautiful photo essay. Excellent storytelling through your images. Well done! Wonder no more, I am sure many, many enjoy! >>> sharing memories, laughs and yams! The question is: Will he ever? >>> The question is: Will he ever? Probably not but one of his daughters was riding him pretty hard about it so we’ll see. Love this great site. Especially in your various articles carrying the fantastic shots of the innocent and carefree children. More of these great cuties shots. They are so cute and have a lot to teach the so called “adults” and all the global politicians with corrupt self centered agendas. Only if they can learn from these so called innocent children, there will be no wars and no need for superficial possessions. Thank you for the great work, of showing the other kind side of China and warm hearted side of you.